I’d like to say that in this year, I’ve discovered the answers to solve issues related to hatred and discrimination. I wish I felt like our nation and our world has made great strides. I’d like to be able to comment that incidents of hate have drastically diminished (Note: according to ADL reported incidents increased by 57% in 2017). Of course, those of you who have taken the time to read a column such as this know that sadly, this is still not our reality. What I have discovered in this past year, however, is that there is power in community and conversation. The ripples of Charlottesville have made uncomfortable conversations rise to the surface and in doing so; have brought in new voices and opinions that may not have been ready or felt safe to speak out in the past. Not all of these voices are ones of agreement but there is power in that as well—learning to have effective discourse on issues that divide us is a critical issue in building stronger communities. One of the places I have been privileged to witness this is within my own classroom and school. As a small Southern town, the issues of Southern history and heritage are part of our community just as they are part of the community of Charlottesville and many others throughout the South. Not all of my students approach this history from the same cultural and historical background but day after day, I repeatedly witnessed respectful and effective discourse on topics that had previously lay dormant. In our region, many schools and segments of our public infrastructure such as roadways bear the names of Confederate leaders. Some students believe that these names should be retained for the sake of marking the importance of local history while others wish to see the names altered because of their direct links to issues such as slavery and oppression. Many of my students were able to vote in our local elections this past spring and some made choices based on this very issue. Despite differing opinions, most students are able to discuss their beliefs in a respectful and appropriate manner. I have been personally fortunate to witness this repeatedly in my classroom and believe that some of these very skills were facilitated by discussion of tough topics such as the Holocaust within the confines of our classroom walls. In the wake of the incidents in Charlottesville, I utilized the USC Shoah Foundation’s IWitness mini-lesson Promoting Effective Conversation Skills, and I plan to make this a staple in my classroom, regardless of the subject I am teaching. The testimony of Holocaust survivor Henry Oertelt and the strategies employed in this mini-lesson helped my students consider ways to disagree but still respect one another. To me, the importance of skills like these goes beyond the content and I am grateful for tools such as this to help me in this process. It is my hope that as these students go out into the larger nation and world, they will carry their effective conversational tools with them. These students can show the world that you can disagree and still shake hands and walk away from a conversation a bit more educated on what and why the other side holds their beliefs and opinions. These students can also educate others on the lessons they learned from studying the Holocaust—that every human being matters and how the path of hatred doesn’t always have to have the same conclusion. They will take the lessons of Holocaust survivors like Henry Oertelt, Kurt Messerschmidt, and Itka Zygmuntowicz and show the world that there is hope for a brighter future even in the complicated and seemingly uncompromising world that we are all trying to navigate today. It is our task as educators not to shrink away from complicated topics and histories but instead, to provide our students with the tools to navigate them respectfully. For more resources on teaching about Charlottesville, view the #CharlottesvilleCurriculum collection. And if you're ready to join a conversation, register for our free webinar: After Charlottesville: How Uncomfortable Conversations Can Overcome Hate. This article was originally published on August 6, 2018, on the Echoes & Reflections website and can be found here. 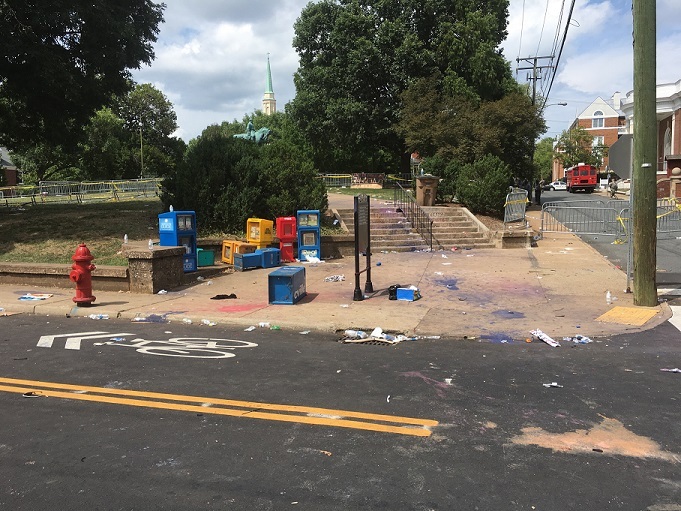 In the aftermath of last year’s events in Charlottesville, VA, Jennifer Goss, an Echoes & Reflections facilitator and classroom teacher from Staunton, VA, reflects on how “hate in our backyard” impacted her classroom and community. A year later she reflects on how her students’ study of the Holocaust has contributed to their healing process and gives them the skills to engage in respectful dialogue on complex issues.